Gypsy girl, India submitted to ‘Photo of the Day’ assignment on National Geographic. Kristian Bertel has contributed to the National Geographic Your Shot community with an assignment called ‘Photo of the Day‘. For this photo assignment, which is curated by Jeanne M Modderman a National Geographic photo producer wants us to celebrate the Your Shot community. What better way to do so than with an assignment dedicated to stunning photos from all of us. She is proud to announce that National Geographic’s Photo of the Day feature is now completely powered by Your Shot. For several months, Your Shot photos have been appearing in more than ninety percent of each month’s roundup. It only made sense that we make it the full hundred percent. What is ‘Photo of the Day’ on National Geographic? ‘Photo of the Day’ is one of the top performing features on National Geographic where they are looking for pictures that told a story in a single frame. There needed to be enough going on that the viewer would be compelled to pause for a moment and take it in. Nat Geo came across many images of the same situation, but it was the ones that had something unique the light, the composition, the palette, the mood—that caught their eyes. When looking for photos for ‘Photo of the Day’, one of the editors always searched for photos that gave a strong sense of place, were technically perfect or nearly so, and brought awe to the viewer. ‘Photo of the Day’ is a chance to see something unexpected. Strive to produce photos that are broad in scope but also show detail. Give the eyes plenty to feast on. A lot of people always ask them selves once in a while what makes a great caption. The photographers are actually the ones who provide not only the compelling image but also the building blocks of a great caption to go with it. The information they share when they submit their images intuits the questions the photo will inspire, and then answers them the caption can write itself with the right information. The more National Geographic can incorporate the photographer’s voice, the better they want the photographer and the image to be the star. What are the National Geographic editors looking for in photos? Here are what they love to get from Your Shot photographers: Location, where was the image taken. If it shows a different way of life from what we are used to, or especially if it inspires wanderlust, the audience will want to know where the photograph is taking them. What lengths did the photographer have to go to the get the shot. Did they get up very early in the morning to ensure perfect lighting. Did they have to hike for miles for a chance to see an elusive subject. Or was the capture totally serendipitous a lucky shot. In short, they want to go behind the scenes. What is the story behind the photo. Captions are as important as ever for Photo of the Day. Each photo must have a solid caption with information about how you got the shot and any anecdotes that would enrich the photo. As Jeanne says it: ”- As you probably all know by now, photo editors see differently. One month in as the new editor for ‘Photo of the Day’ – or ‘POD’ as we call it here at headquarters – I’m looking for photos that evoke wonder, curiosity, and inspiration. I look for precision more than perfection. The photos should be works of art that make you say, I wish I would have taken that!”, she says. The photographer chose to submit a photograph of an Indian gypsy girl in India. 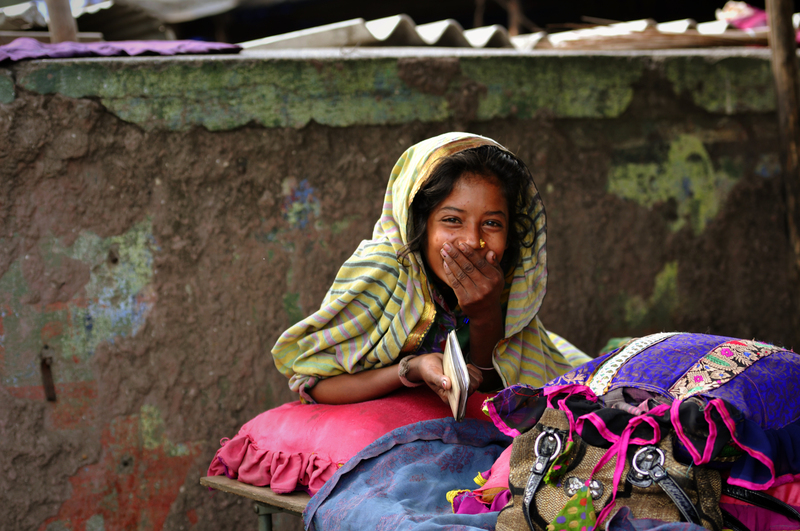 He was traveling and photographing in Mumbai, when he encountered this Indian Gypsy girl near Dharavi. ”- I was not simply looking for showing a portrait of a child, I wanted the image that tell a story about the wonder, joy, and curiosity that a child has”, the photographer Kristian Bertel says. Although these Gypsy groups are spread throughout India and not only in Mumbai, where the Indian girl was photographed, most of them are concentrated in such areas as Punjab, Madhya Pradesh, Uttar Pradesh, Madras, Orissa and Andhra Pradesh. A Gypsy will change occupations and activities, adapting to a changing society’s needs, because they depend on the people in that society for their livelihood and a Gypsy will only settle down when he cannot adapt to the needs of the region.